To mark the 40th anniversary of Earth Day, we would like to share a few insights on why Cloud Computing presents a strong green idea as technology and business grow. Next generation businesses have realized the inevitability of reducing their carbon footprint, as they evaluate their impact on the environment. 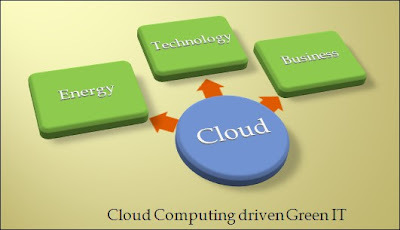 Being an inherently energy efficient technology, the Cloud has emerged as a prime option for this purpose. Running, maintaining and servicing huge, power eating data centers are creating massive carbon footprints and business no longer see this as a viable option. Going green not only boosts the organization’s image in the market since customers are looking for environment friendly corporations, but also reduces direct financial overheads. Studies show that if only work places were to adopt best practices and go green, billions of dollars can be saved. Many of the servers in organizations are not doing any complex computing but are used for routine tasks such as handling DNS lookups, processing email, filtering traffic and storing data. Most organizations maintain a separate server for each function! While Cloud Computing companies often lease space in data-centers, they pay a premium for the power, cooling, and rack-space. These data centers, to remain competitive try hard to be efficient with their computing power: virtualization, efficient software and what we consider as smart power management. Cloud Computing also overcomes the geographical limitations related to computing power offering it on demand, with significantly lower cost and high scalability options. This brings a drastic reduction in carbon overheads associated with idle, power eating servers. Computing power lying idle at one geographic location can be harnessed over the Cloud at some other location in a different time zone. Most of the public Cloud vendors also utilize “green” ways to maintain their data centers. They purchase wind power and carbon offsets in order to compensate for the environmental impact caused by electricity. In 2005, web hosting companies used the same amount of energy as 150,000 megawatt power plants would put out. The technology today is more advanced than it was in 2005 and there are more websites out there as well, so these numbers would have definitely gone higher since then. Each megawatt of power puts out 2000 pounds of carbon dioxide per hour, which is an incredible amount of pollution to put into the atmosphere. Cloud data centers are using virtualization to reduce this carbon emission. 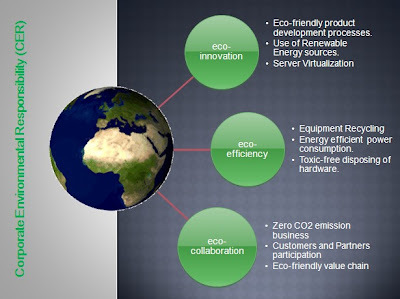 Understanding the complete life cycle of going Cloud can also help us understand where and how can we apply green strategies to reduce the customer’s carbon footprint. Like, which IaaS provider to choose, based on the IT equipment used at their data centers and are these equipment being disposed responsibly after use? Physical hardware at Data centers can contain chemicals too, which can harm the environment if not properly disposed, thus one must always research an IaaS provider - if they have government approved guidelines for maintaining and disposing their hardware. By leveraging the diverse and scalable services available through Cloud vendors, many companies are experiencing significant reductions in utility service consumption at their commercial locations. According to Forrester, over 40% of people in IT departments believe energy efficiency and equipment recycling are important factors to consider and about 65% believe that reduction of energy-related operating costs is the driving factor for implementing green IT. Virtualization allows you to partition physical hardware into multiple logical virtual machines, each running on its own operating system and network connectivity. With the rapid provisioning capabilities in the Cloud, one can host more applications with fewer servers. Higher utilization of resources with lower cost and without leaving carbon footprints on earth, that’s the power of Cloud Computing. WOLF runs on IaaS provider iWeb who as a part of their Corporate Environment Responsibility adopt Recycling, toxin-free materials, renewable energy and efficient power consumption of energy produced from hydro electric dams. Product development processes followed at WOLF are eco-friendly with a focus on energy efficient work culture. Being a Cloud player, we believe in server virtualization for internal projects and processes. With our partners collaboration, we aim to nurture zero CO2 emitting SaaS businesses and provide an eco-friendly value chain in our services.